We have been in Clothing Labels market in the UK for more than 15 years. 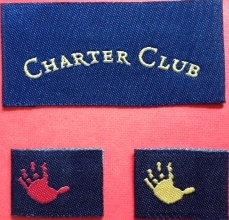 Many of our designer clients are very satisfied with the embroidered labels that we produced for them. They like the details of woven labels custom to their artwork specification, which truly express the important message of their brand garment labels. Being a professional garment label manufacturer for more than 15 years, we promise a high quality of woven name tags we delivered to clients. Our Garment Label Makers are able to create completely personalized garment name labels, fabric labels for your brand clothing products. Below is a small range of Labels for garments that we created for our clients. Contact us to discuss the woven name labels for your clothing products. We offer free sampling, free UK delivery, and very low minimum.